A late-summer adventure begins for us—like many—on the CDG Metro station from Paris. It seems the forests of historical stone and the rock of incredible beauty are, at this point, a world apart. Early morning and midweek, we are on the trains below the hustle and bustle of the City of Lights, leaving Parisian-tourism for another adventure. En route instead to the forests of Fontainebleau, while still a bit groggy from the overnight flight. 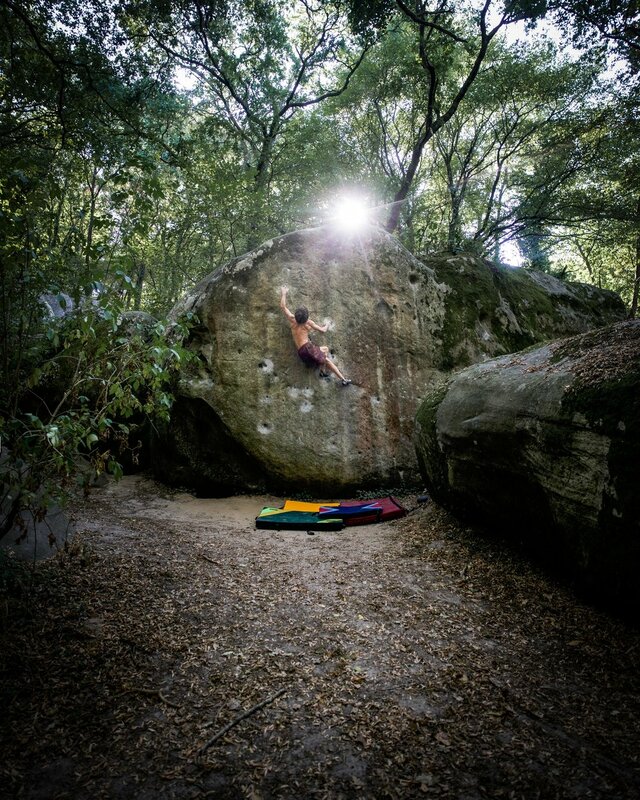 The massive and sought-after area of unusual sandstone boulders ,and the birthplace of bouldering, is just an hour away. Through books, media and photos in the thousands, we have seen it all. 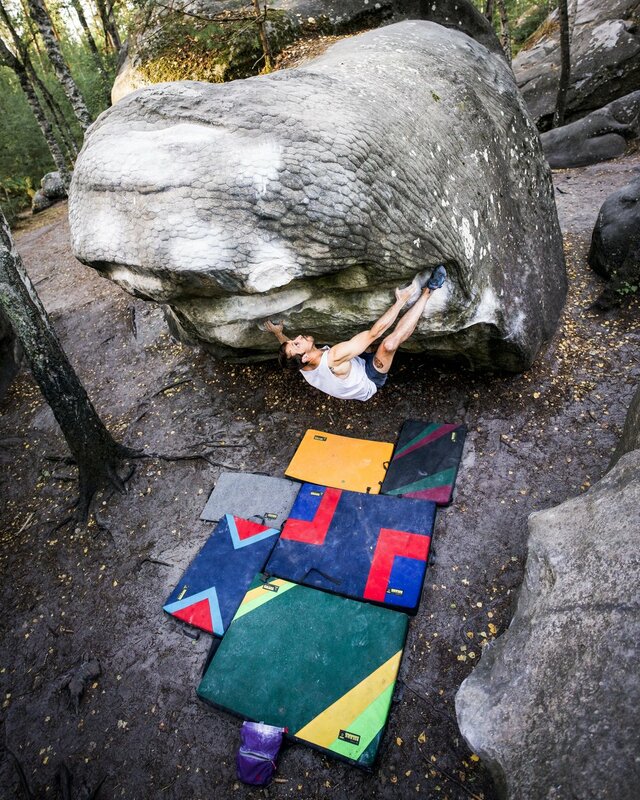 From the vastly forested wilderness and sandy grounds to the footage of hundreds sending Rainbow Rocket or Jimmy Webb topping-out Guillaume Glairon-Mondet’s infamous Le Pied a Coulisse. This place is like no other, in sheer size and uniqueness. It brings together bikers and backpackers, wanderers and everyday climbers. As I was still nursing a back injury, my two weeks in Font would be a trip consisting solely of photography. For the others, it was a month-long trip to explore, discover and push themselves on some of the most impressive boulders in the world. The late-September days ahead were forecasted as dry and scorching. Daily temperatures were expecting to range from the low to high 80s. Ultimately, the decision was to focus on using the days to research the most famous zones and map out the nights to-dos. Evening sessions would be short. However, the late-afternoons presented the best chance to go hard for a few hours amidst cooler temps. As our first few days unfolded under withering late-day sun, we were lost in thoughts. Finding equally, the total awesomeness of our surroundings and also the harsh difficulty that would come while attempting to conquer these iconic lines. In addition to the actual climbing, venturing around an area as large as Font in the evenings and under slim-light, became a challenge in and of itself for us first-timers. As we became more comfortable with a few of the larger zones, such as Bas Cuvier, we felt the overwhelming stress alleviated and our attention honed-in on the exceptional ‘black-star’ area classics scattered about. Climbing and getting familiar with the large, elephant-skin textures and uniquely shaped boulders was an additional test. 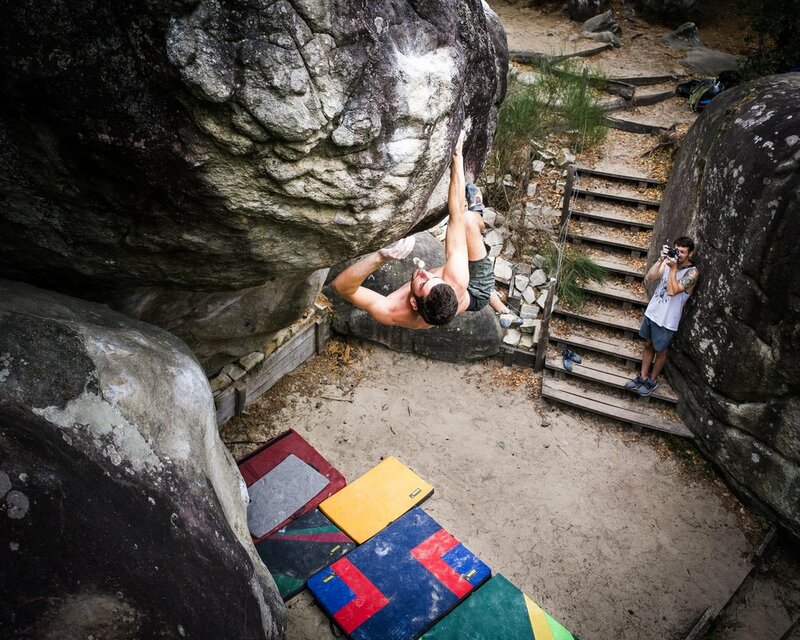 Locally, our crews' scorecards held hundreds of problems in the V12/13 range. Although humbly, our first week in Font saw only a top-out max of V9. It just took time. Getting comfortable with this foreign environment, stiff-grading and style of rock, was a taxing process. Internal vibes and nerves began to settle. The guys would begin dispatching difficult lines rather swiftly and in a few cases, during flash-goes. The excitement grew. Problems that put up such a fight during the initial days, went down and the crew’s comfort level altered to an optimistic tone. Climbing started to become fun again. The excitement did temporarily fade when returning one night to a car with a flat tire, after a jam-filled session with three-fifths of the ‘Big-Five’ going down. Otherwise, temperatures began to drop and our evening sessions transitioned to all-dayers. Psych was sky-high for the team of four and the trip would personally become stashed as a life-long memory. No, my body did not get the chance to feel the intensity and satisfaction with ascending any world-class Font stone. But I did the chance to immensely enjoy that satisfaction of being amongst climbing history and in an other-worldly bouldering mecca, with a really awesome crew and the international climbing community.